Can we have multiple EndPoints? Can be expose same contracts on more than one EndPoint? How base address works with EndPoints? Can we have more than one base address? How to configure EndPoint in code? Do we need to configure EndPoint in self hosting? Can we have more than one Service Contract? And many more questions of such like above. To answer above questions, let us start with understanding what is EndPoint? 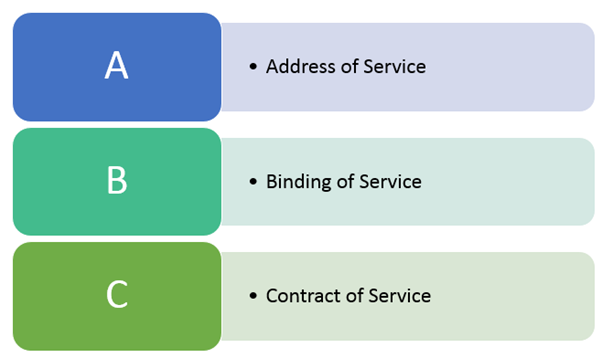 If same Service with different Bindings on same Address and for same Contract. As a Service designer you may consider to create multiple EndPoints in following scenarios. Service wants to expose more than one type of binding. Service wants to expose more than one contract on the same binding. Service wants to expose same binding and contract on different addresses. Now let us see how we can expose a Service on two different bindings using multiple EndPoints. For two different bindings, we will create two different EndPoints. At client side same service can be consumed by passing EndPoint name. We are passing ep1 as name of the EndPoint, so client will consume service using basicHttpBinding. If you do not pass EndPoint name at time of proxy creation then run time error will get occur while calling service. 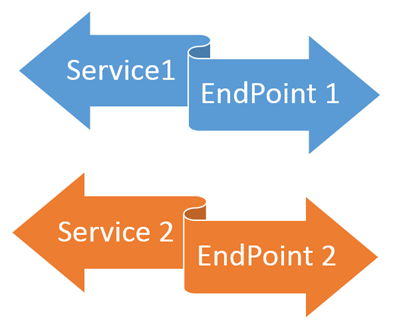 In above scenario, we exposed same service on multiple bindings using two different EndPoints. You can add more than one base address using add in baseAddresses section.Advantage of having base address is that, if we are moving service from one server to another then only base address need to be changed and all EndPoint will work on updated server. WCF allow us to give multiple base addresses for each type of protocol. And at the run time corresponding endpoint will take the base address. So you can expose IService1 on multiple EndPoint with more than one binding as below. We are exposing IService1 with basicHttpBinding and netTcpBinding both. At the run time WCF will attach corresponding base address to respective binding. You may want to host same service on different server, in that scenario also service will have same contract and binding whereas different address. There could be scenario when you will have to expose multiple Service Contracts. Service Contracts will be exposed on separate EndPoints. Having multiple EndPoints for services are sometime essential for a good service design. You may want to expose same service on different EndPoint for Internet user whereas for Intranet user on separate EndPoint. I hope this post is useful for you. you have explained concepts very well. I am trying to to give access to two clients with the same methods in wcf.I followed above steps.But you know on adding service reference they will see “two endpoints” in there web.config.Is there any solution to restrict the two endpoint in clients machine.They should see only one endpoints and also when we are write service it will have multiple methods I want certain methods to be in wsdl.I sthis possible. Yes PriyankaShankar , you need to explicitly mention Endpoint Name as follows. Thanks for writing such a nice article on WCF. But you know on adding service reference they will see “two endpoints” in there web.config.Is there any solution to restrict the two endpoint in clients machine.They should see only one endpoints and also when we are write service it will have multiple methods I want certain methods to be in wsdl.I sthis possible. How to stop exposing multiple endpoint at client side? My service have more than one end point. how can i merge them into a single end point? which architecture should i use for that? 3. The service is self hosted without IIS. I am getting error “This collection already contains an address with scheme http. There can be at most one address per scheme in this collection. 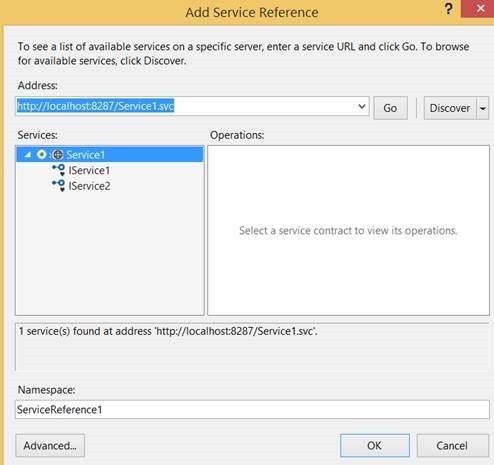 If your service is being hosted in IIS you can fix the problem by setting ‘system.serviceModel/serviceHostingEnvironment/multipleSiteBindingsEnabled’ to true or specifying ‘system.serviceModel/serviceHostingEnvironment/baseAddressPrefixFilters’. but it appear that this worked for IIS only and not for self host as the error remain same.